Cut fish fillets into small pieces; put in a large saucepan or kettle with chicken broth, seasonings, and potatoes and carrots. Cook, covered, for about 15 minutes, until vegetables are tender. In a medium saucepan, sauté onion in butter until tender. Stir in flour until well blended. Gradually add milk, stirring constantly. Continue stirring and cooking until thickened. Add to cooked vegetables and fish; continue cooking for about 5 to 10 minutes, stirring frequently. 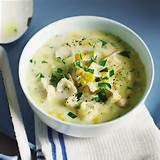 Fish chowder recipe serves 4.